On Sunday we looked at three of the most powerful words in Scripture, where Jesus says, “It is finished” (John 19:30). Here though is the difficulty with these words: what is the “it”? Because the context isn’t actually all that clear, lots of people have lots of ideas about “what” is finished in Jesus’ last words. People say things like sin, death, evil, Jesus’ mission, pain, and others. And surely all of them have theological warrant, but what we really wanted to get at was what does Jesus mean? We have a tendency (and have been taught) that Jesus dies primarily for our individual sins. So when we come to a passage like this, we read our ideas into the text. So traditionally many people say that the price of sin has now been paid. That’s what’s finished. But the text doesn’t mention sin, evil, payment or anything like that. So what is actually “finished”? That’s what we explored on Sunday. And when the immediate context doesn’t help, you need to widen your scope, so we began in the beginning of John. John is pretty clear in John 1:1 that he is telling a creation story. John begins with “In the beginning…”; this is a clear echo to Genesis. So John, right off the bat, is saying his story is going to echo, or be a riff, on the Genesis story. The next thing we noticed was that in John he is counting miracles. He actually says this straight out (this is first miracle, the second miracle, etc). And if you count the miracles there are 7 miracles Jesus does. Seven acts of Jesus, just as in the beginning Genesis story there are seven acts of God. There is this parallel between what Jesus is doing in John, and what God was doing in Genesis. But then comes the twist. Jesus dies and was resurrected. This is miracle number 8. This is the start of a new week, this is new territory, this is a new beginning. It’s as if John is saying, that Jesus is starting a brand new creation story, that the old is gone. In fact, if you look at end of God creating the world in Genesis, he says “it is finished twice” in close connection. And John has Jesus uttering the same thing in John 19. 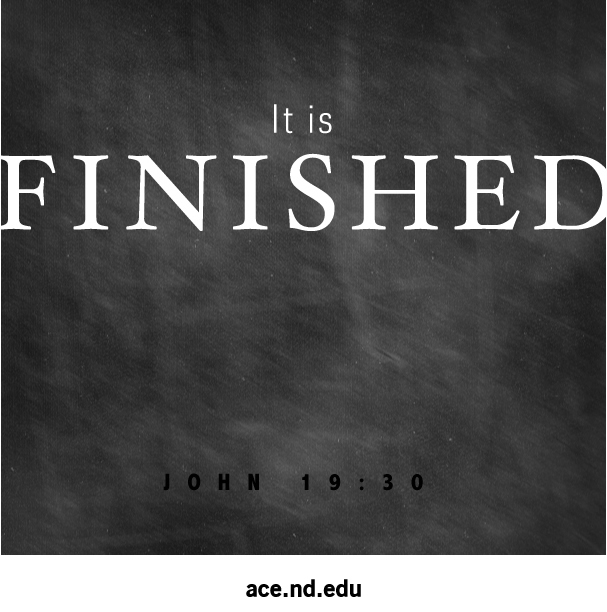 He says “it is finished” twice in close connection (John 19:28; 30). John is alluding to the fact that the old creation account is now complete. It is not just “evil, or sin” but the entire old way of living under the burden of sin is complete. That creation account, that world, that way of living is now finished. And with Jesus’ resurrection (miracle number 8) a brand new way of living is founded. A new kingdom, a new way of living, a new creation is starting. John through hints, allusions, and out right clarity – is insisting that with Jesus’ death and resurrection, it is not just about our personal sin. It is about a whole cosmos being infected with sin being finished, and a new world being birthed out of Jesus’ resurrection. Jesus’ death and resurrection is the finishing of the old world, and the starting of the new. That’s what is finished, and what is before. So we ended with asking are there any areas of our lives we are living in the old world. Are we seeking to earn God’s approval? Are we tied to sin? Are we choosing to live in sin – rather than in God’s kingdom? Because Jesus says that whole way of living is finished, there is a new way to live – a new gardener is here. So our challenge was to live in God’s kingdom this week. And to help that we went old school – giving us a verse to memorize and pray daily this week. It’s from Philippians 1:6 “And I am sure that God, who began the good work within you, will continue his work until it is finally finished on that day when Christ Jesus comes back again”. There is our word again, “finished”. So this week live in God’s new kingdom of hope, love, and peace. Don’t slide back into the old world of sin that is finished. And when you feel yourself sliding, pray this verse – trusting that God will finish what he has started. Because Jesus is right, the old is finished, and with him the new has come. Big Idea: The old is gone and finished, and a new world is here. Whenever something gets familiar we are in dangerous territory. Jesus’ death and resurrection isn’t just about Jesus dying for our sins, it’s about Jesus creating a brand new world. The old world is finished, and when Jesus rises again with him is a new world. John is saying with Jesus’ death, the old world is finished, and a new world is being birthed because of Jesus. Is there anything that needs to be finished in our lives today. Some of us might still be living in the old world of earning God’s approval. Some of us are still living under the lie that we are sinners, and unable to break free from sin. Some of you are choosing to live in the old world of sin, evil, and hurt and you know it. What stuck out to you from the sermon? What was challenging to you? How did God speak to you through it? What was new? Have you practiced Lent before? What can you fast or give up this year? Had you ever noticed some of the connections between John and Genesis before? Which ones were most surprising to you? What does the “old world” way of living look like – in your life? What does living in a new kingdom look like, and feel like? Is there anything that is “old” that you need to let go and say – it is finished too? Why not actually act out this with your kids? Get some cardboard, some glue, or paper mache and make a creation story. Make up trees, maybe a volcano for some fun, and talk about how God made the world. Talk about how Jesus re-made the world too, and with it we don’t need to hold onto hurt or hate anymore. Challenge for the Week: Trust and live in the new world, the old is finished.